Back in the 70’s and 80’s the output of Marvel UK was one of the keystones in keeping the spirit of the Star Wars saga alight between the release of the films, and every year during the festive period kids across the country would be treated to a tradition that’s run from the grandaddy of British comics The Beano in the 30’s right up to the releases of the present day – hardback Annuals. 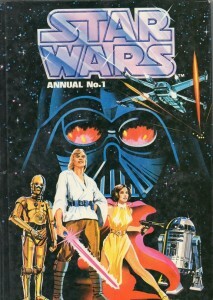 In the States there were three Star Wars Annuals released in 1979, 1982 and 1983, but the UK was treated to 9 annuals between 1978 and 1985 as well as an Ewoks annual in 1988. Differing from their American cousins the UK Annuals were hardbacks in the traditional UK magazine size and were released by Marvel UK, in conjunction with other specialist companies. Marvel UK was started in 1972 after years of outsourcing the Marvel product to other companies. The success of these titles led to the establishment of Marvel UK, and a fast growing roster of titles incorporating major Marvel US titles and home grown stories by a group of up and coming writers and artists including Alan Davis and Alan Moore. The first Star Wars annual, released in conjunction with Brown Watson, was a 63 page reprint of the classic adaptation of the first film, still known simply as Star Wars, by Roy Thomas and Howard Chaykin. Originally published in the first 12 issues of Star Wars Weekly the annual was a common gift across the country, being read and re-read numerous times by ravenous fans who had a limited amount of product to devour. In these days of weekly Dark Horse releases it’s hard to imagine reading and re-reading a title but, no slight to Dark Horse intended, back in ’78 we only had that 6 issue comic and the few issues that had been released afterwards consisting mostly of a controversial green Lepus carnivorus. I know that when I got to the final page I would often go right back to the start and begin again. 1979’s second Star Wars annual, released by Grandreams was a reprint of Star Wars Weekly issues 25 and 26, which itself reprinted the US Marvel issue 13 “Day of the Dragon Lords” and Star Wars Weekly 27 and 28 which reprinted US issue 14 “The Sound of Armageddon”. Written by the legendary Archie Goodwin and drawn by Star Wars stalwart Carmine Infantino, it saw out the decade on a wave of high adventure. 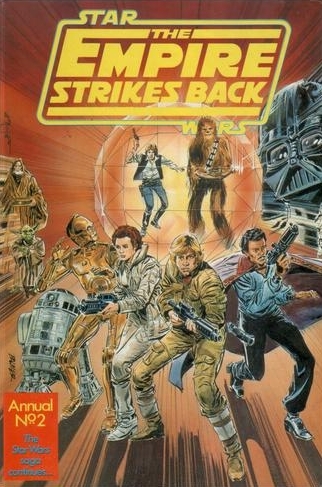 1980 brought not only the second chapter in the Star Wars saga, The Empire Strikes Back but also it’s comic adaptation, released by Marvel/Grandreams. Released initially as issues 118 – 135 of Star Wars Weekly (which reprinted US Star Wars issues 39 – 44) the 63 page Annual, written by Archie Goodwin and drawn by two of George Lucas’ favourite artists Al Williamson and Carlos Garzon, brought not only the stunning story of the second Star Wars epic to the Annual format, but also some intriguing glimpses into an early, impish and purple version of Master Yoda before Stuart Freeborn had completed his magic and Williamson redrew the character for later versions of the adaptation. Wrapped behind a beautiful and distinctive Bob Larkin cover I have hugely fond memories of this annual as it was the last gift I’d recieve from my Grandmother, who passed away in late 1981. As with many Star Wars releases of this era, they come with some very special attachments. 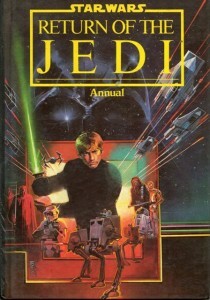 The Empire Strikes Back and Star Wars were both honoured with Annuals in 1981, with the Empire Annual reprinting the J.M. DeMatteis and Carmine Infantino story “The Dreams of Cody Sunn-Childe” from issue 46 of the US Marvel run and issue 141 of the UK Empire Strikes Back Monthly along with Archie Goodwin, Al Williamson and Walt Simonsons “The Crimson Forever” from US issue 50 and printed in the UK for the first time. 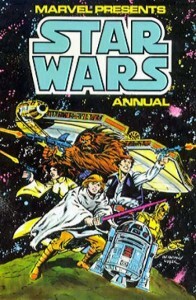 Both quirky tales, they were complimented in ’81 by the return of the Star Wars Annual, which featured three stories. “The Third Law” from US Star Wars issue 48, “Death Probe” from US Issue 45 and the classic “Droid World” (which would soon be adapted into a Read-Along-Adventure by Buena Vista, as I discussed in my Read-Along-Adventures entry) from US Issue 47. The stories were first printed in the UK in The Empire Strikes Back Weekly 136-139 and The Empire Strikes Back Monthlies 140 and 142. Sitting behind a dazzling cover by Paul Neary (who among other achievements would go on to become editor-in-chief of Marvel UK in the 1990s) the annual would be the last before the final chapter in the second Star Wars trilogy arrived. Archie Goodwin and Al Williamson would return to complete the saga after their stellar work on Empire and the weekly magazine strips with Return of the Jedi, reprinting the Marvel Super Special and 4 part Limited Series (one of Marvel US’s first) which had already been released in the UK in the first 8 issues of the renamed UK weekly, renumbered and renamed Return of the Jedi Weekly. Released by Marvel/Grandreams and lying behind the same Bill Sienkiewicz cover that graced the Super Special, it was a big seller and along with the RCA soundtrack, Read-Along-Adventure and Futura novelisation it truly brought the grandeur of the final chapter home to UK fans in 1983. 1984 was a busy year for Star Wars, with the release of The Ewok Adventure on US television, arriving in the UK and Europe on the big screen as Caravan of Courage. The 1984 Return of the Jedi Annual gave us a striking Glynis Wein cover collaging images from Jedi and collecting “Chanteuse of the Stars” from US Issue 77, “The Big Con” from Issue 79 and “Ellie” from US issue 80. Printed here in the UK in Return of the Jedi Weekly between issues 20 – 43, the three stories all written by Mary Jo Duffy and drawn by Ron Frenz and Tom Palmer make up one of the strongest of the UK annuals, the heart-breaking “Ellie” particularly standing out as a strong tale. The striking final panel of a tearful See Threepio stays long in the memory. 1984 also brought a collection behind a Jolly John Higgins cover that pulled together the adaptations of both Empire and Jedi. Unique in that it was a Marks and Spencers exclusive it was tougher to find but a treat for fans of Goodwin and Williamson. By 1985, while Star Wars was still in full swing with Ewoks and Droids both on air and a second Ewoks television movie released in the UK on video via MGM, the shadow of the Dark Times was near. 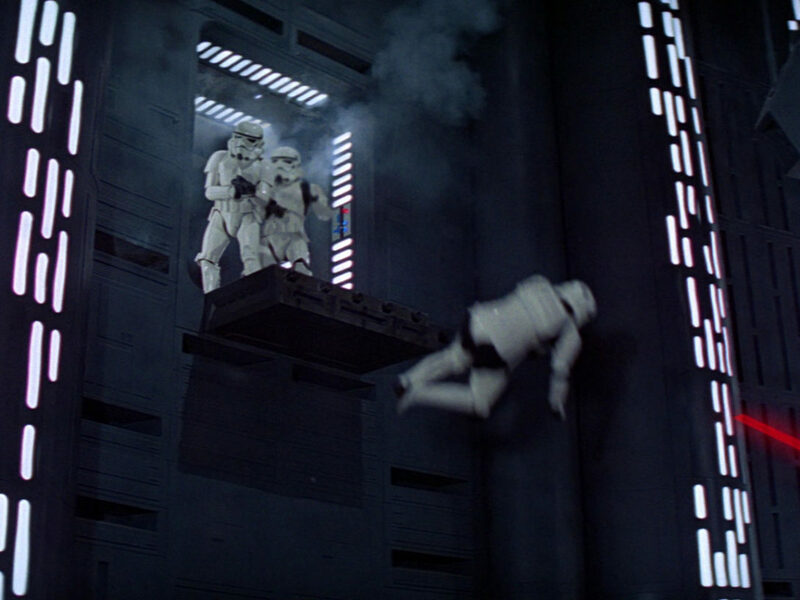 The Kenner line was rapidly fading into the bargain bins, the whole tone of the Star Wars line had become very much a young childs arena and with George Lucas putting the saga on ice to concentrate on other pursuits the Star Wars galaxy approaching a period of hibernation. The 1985 Annual collected the first issue of Star Comics Ewoks title “The Rainbow Bridge” (written by David Manak and drawn by Warren Kremer) along with 1983’s US Annual #3 “The Apprentice” (written by long-time writer and editor Mary Jo Duffy and drawn by Klaus Janson). Released by Marvel/Grandreams, it would be the last in an almost unbroken run of 9 annuals in 8 years, the last in the first age of Star Wars. But not the last Annual by Marvel UK. By 1988 we were deep in the midsts of The Dark Times. In 1987 West End Games had launched The Roleplay Game to great acclaim by roleplayers but Return of the Jedi Weekly had ended with its 155th issue on 7th June 1986, relegating Star Wars to a back-up strip in Spider-Man and Zoids weekly. 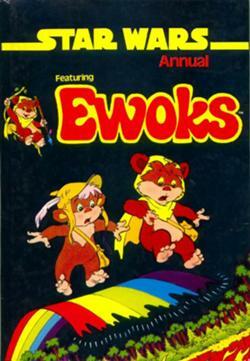 Ewoks had continued as a title, capturing the kids market but by 1988 even that had ended. This final Marvel UK Annual compiled two comic strip adventures “The Undwerwater Kingdom” from issue 9 of Star Comics run and “Rites of POwer” from issue 2 along with the prose tales “Chief Chirpa Kidnapped!”, “Return of the Great One!” and “The Ice Princess”. 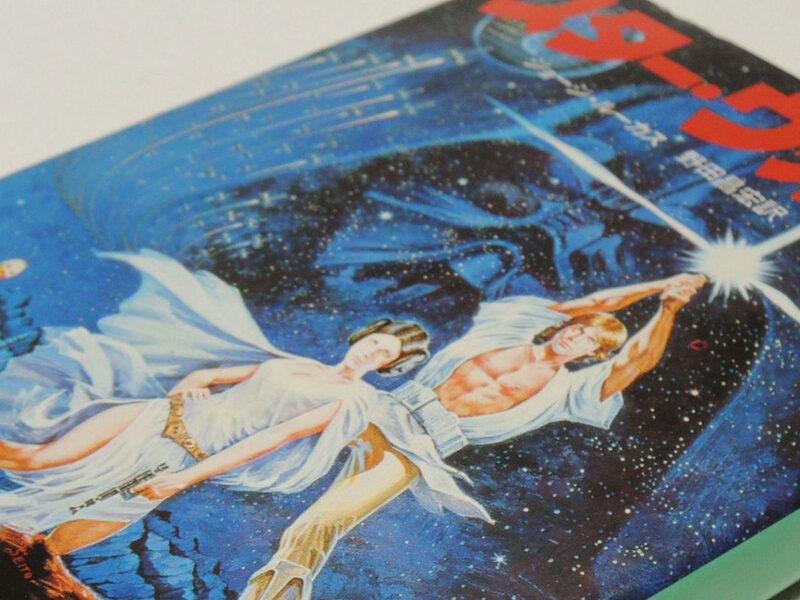 It marked the end of a 10 year association between Star Wars and Marvel in the UK, a pairing that brought the magic of Star Wars to young UK fans every week and via these iconic Annuals made our Star Wars memories even more awesome. 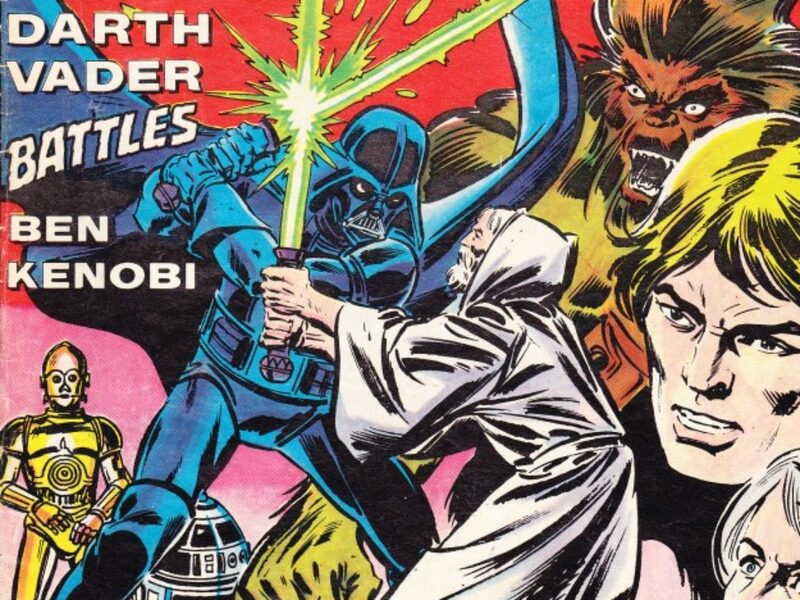 Back in the ’70s and ’80s, Marvel UK was one of the keystones in keeping the spirit of the Star Wars saga alive between the release of the films. 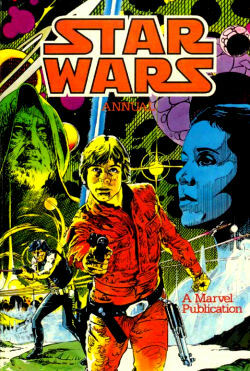 Once each year, comic book fans would be treated to even more Star Wars in the form of special over-sized releases: hardback annuals. The first Star Wars annual, released in conjunction with Brown Watson, was a 63-page reprint of the classic adaptation of the first film, still known simply as Star Wars, by Roy Thomas and Howard Chaykin. Originally published in the first 12 issues of Star Wars Weekly, the annual was a common gift across the country, being read and re-read numerous times by ravenous fans who had a limited amount of product to devour. In these days of weekly Dark Horse releases it’s hard to imagine reading and re-reading a title, but, no slight to Dark Horse intended, back in ’78 we only had that six-issue comic series and the few issues that had been released afterwards. I know that when I got to the final page I would often go right back to the beginning and start again. 1979’s second Star Wars annual, released by Grandreams, was a reprint of Star Wars Weekly issues 25 and 26, which itself reprinted the US Marvel #13 “Day of the Dragon Lords,” and Star Wars Weekly #27 and #28, which reprinted US issue 14 “The Sound of Armageddon.” Written by the legendary Archie Goodwin and drawn by Star Wars stalwart Carmine Infantino, it ended the decade on a wave of high adventure. 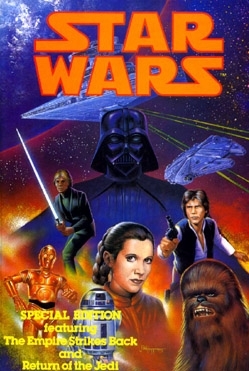 1980 brought not only the second chapter in the Star Wars saga, The Empire Strikes Back, but also its comic adaptation, released by Marvel/Grandreams. Released initially as issues 118-135 of Star Wars Weekly (which reprinted US Star Wars issues 39-44), the 63-page annual, written by Archie Goodwin and drawn by two of George Lucas’ favorite artists Al Williamson and Carlos Garzon, brought not only the stunning story of the second Star Wars epic to the annual format, but also some intriguing glimpses into an early, impish, and purple version of Master Yoda — before Stuart Freeborn had completed his magic and Williamson redrew the character for later versions of the adaptation. Wrapped behind a beautiful and distinctive Bob Larkin cover, I have hugely fond memories of this annual as it was the last gift I’d receive from my grandmother, who passed away in late 1981. As with many Star Wars releases of this era, they come with some very special attachments. 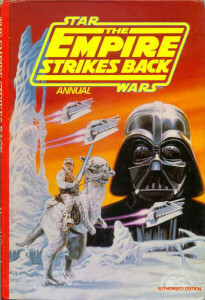 The Empire Strikes Back and Star Wars were both honored with annuals in 1981. The Empire annual reprinted the J.M. DeMatteis and Carmine Infantino story, “The Dreams of Cody Sunn-Childe,” from issue 46 of the US Marvel run and issue 141 of the UK Empire Strikes Back Monthly, along with Archie Goodwin, Al Williamson and Walt Simonson’s “The Crimson Forever” from US issue 50. The return of Star Wars Annual featured three stories: “The Third Law” from US Star Wars issue 48, “Death Probe” from US issue 45, and the classic “Droid World” (which would soon be adapted into a Read-Along-Adventure by Buena Vista, as I discussed in my Read-Along-Adventures entry) from US issue 47. The stories were first printed in the UK in The Empire Strikes Back Weekly #136-139 and The Empire Strikes Back Monthly #140 and #142. Sitting behind a dazzling cover by Paul Neary (who among other achievements would go on to become editor-in-chief of Marvel UK in the 1990s), the annual would be the last before the final chapter in the second Star Wars trilogy arrived. 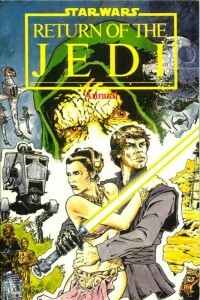 Archie Goodwin and Al Williamson would return to complete the saga after their stellar work on Empire and the weekly magazine strips with Return of the Jedi, reprinting the Marvel Super Special and four-part limited series (one of Marvel US’ first), which had already been released in the UK in Return of the Jedi Weekly. Released by Marvel/Grandreams and utilizing the same Bill Sienkiewicz cover that graced the Super Special, it was a big seller and along with the RCA soundtrack, Read-Along-Adventure, and Futura novelization, it truly brought the grandeur of the final chapter home to UK fans in 1983. 1984 was a busy year for Star Wars, with the release of The Ewok Adventure on US television, arriving in the UK and Europe on the big screen as Caravan of Courage. The 1984 Return of the Jedi Annual gave us a striking Glynis Wein cover, collaging images from Jedi, and collecting “Chanteuse of the Stars” from US issue 77, “The Big Con” from issue 79, and “Ellie” from US issue 80. Printed here in the UK in Return of the Jedi Weekly between issues 20-43, the three stories all written by Mary Jo Duffy and drawn by Ron Frenz and Tom Palmer make up one of the strongest of the UK annuals — the heart-breaking “Ellie” particularly standing out as a strong tale. 1984 also brought a collection behind a Jolly John Higgins cover that pulled together the adaptations of both Empire and Jedi. Unique in that it was a British Home Stores (BHS) exclusive, it was tougher to find but a treat for fans of Goodwin and Williamson. By 1985, while Star Wars was still in full swing with Ewoks and Droids both on air and a second Ewoks television movie released in the UK on video, the shadow of The Dark Times was near. 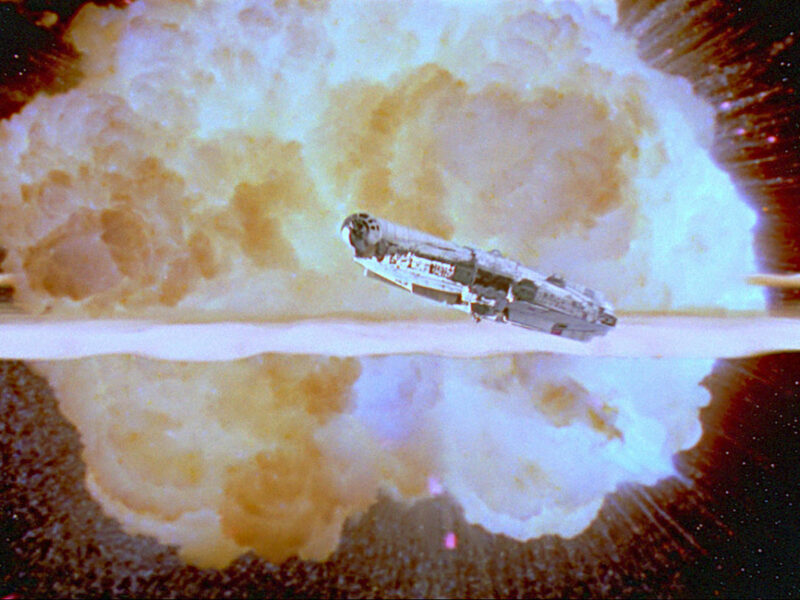 The Kenner line was rapidly fading into the bargain bins, and with George Lucas putting the saga on ice to concentrate on other pursuits, the Star Wars galaxy approached a period of hibernation. The 1985 annual collected the first issue of Star Comics’ Ewoks title “The Rainbow Bridge” (written by David Manak and drawn by Warren Kremer) along with 1983’s US Annual #3, “The Apprentice” (written by long-time writer and editor Mary Jo Duffy and drawn by Klaus Janson). Released by Marvel/Grandreams, it would be the last in an almost unbroken run of nine annuals in eight years, the last in the first age of Star Wars. But not the last annual by Marvel UK. By 1988 we were deep in the midsts of The Dark Times. In 1987 West End Games had launched The Roleplay Game to great acclaim by roleplayers, but Return of the Jedi Weekly had ended with its 155th issue on June 7, 1986, relegating Star Wars to a back-up strip in Spider-Man and Zoids. 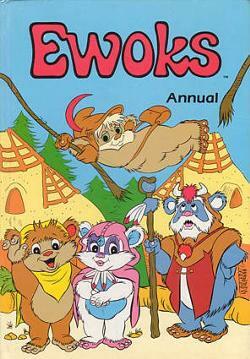 Ewoks had continued as a title, capturing the kids market, but by 1988 even that had ended. This final Marvel UK annual compiled two comic strip adventures “The Undwerwater Kingdom” from issue 9 of Star Comics’ run and “Rites of Power” from issue 2, along with the prose tales “Chief Chirpa Kidnapped!”, “Return of the Great One!” and “The Ice Princess.” It marked the end of a 10-year association between Star Wars and Marvel in the UK, a pairing that brought the magic of Star Wars to young UK fans every week, and via these iconic annuals, made our Star Wars memories even more awesome. 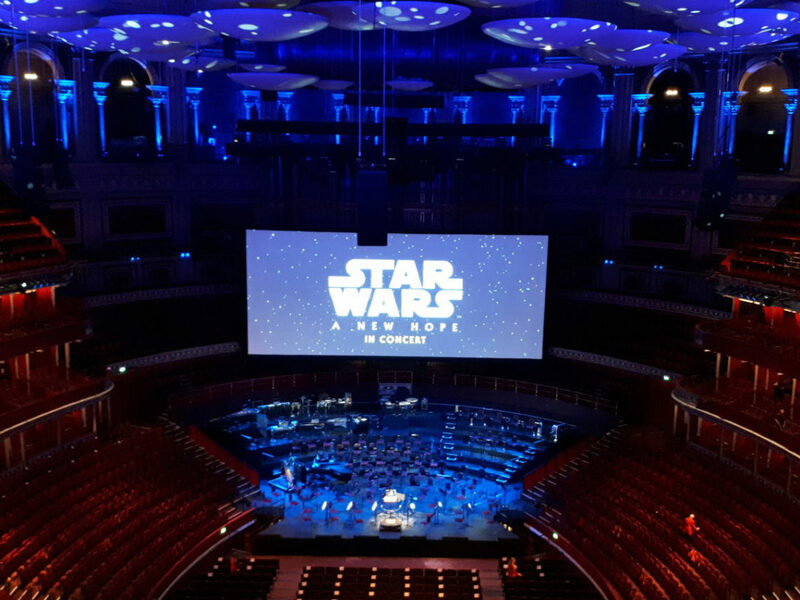 Mark Newbold is a writer for Star Wars Insider and is the daily content editor and co-owner of Jedi News.co.uk. 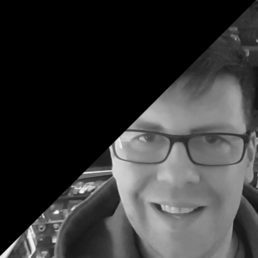 He is about to launch the new UK-centric podcast Radio 1138 with James Burns.